Sorry I haven’t been posting much these days. I recently bought a new place and just moved. So the last week has been nothing but packing and then unpacking! 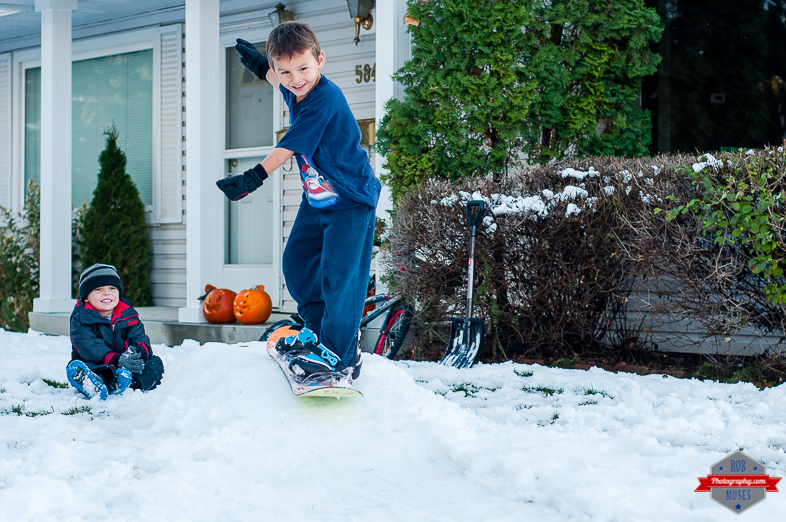 Yesterday I found a little time to have some fun in the front yard with my 2 boys to do some snowboarding on a the very gradual slope in front of our house haha. After 2 runs of holding hands with my youngest son Cameron, I told him to just stand at the starting point so I could take a picture of him standing there. 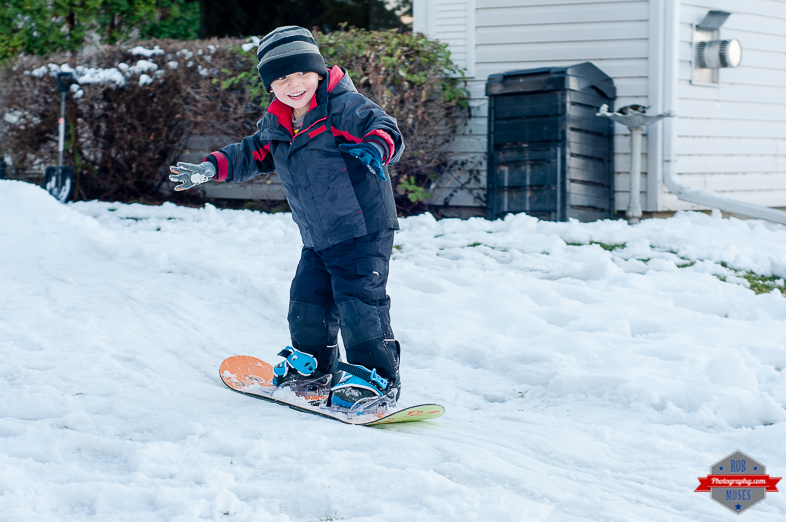 While I was adjusting the settings my camera I looked up to him zipping down the hill on his own haha. He picked it up really fast and loves it. My older son Joshua (5 years old) was also doing a lot better than the pervious year and seemed to enjoy it a lot more too! This entry was posted in People, Personal, Sports and tagged 1st, 50mm, Alberta, awesome, beautiful, Boys, bros, brothers, Burton, Calgary, Canada, canadian, child, children, city, City Life, D300s, dude, dudes, family, first, fun, kid, killing it, love, Mario, metro, Nikon, photo, Photographer, Photography, prime, rad, radical, rippin, ripping, shred, shredding, Snow, snowboard, snowboarding, street, Super Mario, Urban, winter, yyc. Bookmark the permalink. Nice photos Rob and good luck in with your new place. Cute! They look like they are having a blast! Great shots! Congrats on your move. One in coat and gloves, the other in a T-shirt? That in itself is an interesting mix of warm-blooded v. cold-blooded. With the snow I would opt for the coat. Looks like they were having a lot of fun learning to snowboard and be taking to the big slopes before you know it. Good luck with the unpacking. I still have un-opened boxes in the basement from my last move 10 years ago. Haha that’s funny about the box. While we were packing we found a box in our basement that was unpacked from out last move too! I told my wife to toss it out but she refused haha. Anyhow, ya it wasn’t really that cold out that day, but I was waring a jacket haha. looks like you had a great day – more snow in the forcast!!! Yes it was fun :). I am looking forward to COP opening.